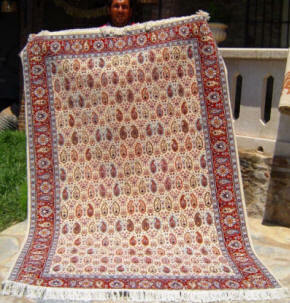 We have reduced the prices of all the carpets and kilims included in our online catalogs. Depending on where you live import duty may be payable. Comments: Hereke carpets traditionally use cotton for the backing. This allows for a greater number of warp and weft threads per cm (inch). The result in a finer finish than with wool and allowing more intricate patterns to be achieved. This is an excellent example in pleasing tones. Hereke carpets are much sought after, not only for their fine workmanship and durability, but as an excellent investment. Our current online prices make this carpet exceptional value. Copyright © 1997-2018 TurkishCarpetsDirect.com. All Rights Reserved.